Medhi is a Bettakuruba tribal whose life revolved around collecting bamboo from the forest. Bamboo was everything to her family. They would eat tender bamboo shoots, make different household articles out of bamboo and sell it to the local farmers; use bamboo for constructing their houses, and for special occasions like calling their spirits or make loud noises to drive away marauding elephants. Medhi owned a small patch of two acres of agricultural land, and along with her husband and three children lived a very contented life. Her house was located between Brahmagiri, where I first moved in to the areas, and SVYM's Hosahalli tribal school. For years, I had watched them repair the thatched roof over their bamboo house following every monsoon. I was moved to think that they needed a more pucca house. It was around 1995, and we had just started forming Self Help Groups for women in the area. My colleague Mamatha was overseeing this program, and Medhi was a member of one of the SHGs. As soon as we could initiate a housing program for these women, Mamatha and I felt that Medhi and her family should get the benefit of our assistance. With no understanding of the local context or the capability of the local tribals, we believed that houses had to be the way our engineers or construction team designed them to be. I still remember the day when we met with Medhi and asked her if she wanted a more stable house to live in. Medhi felt amused, as she had never imagined that the house she lived was either 'unstable' or 'unlivable'. Nor did she feel that the house that we offered her was anywhere near what she would be comfortable in! In her own way, Medhi wanted to know what was the total value of our assistance. We explained that it would be in the range of Rs 20,000. She then followed this up with an unexpected question. Were we interested in her having a comfortable home, or were we looking to give her what we believed to be just another house from our own stable of development schemes? Obviously her question was very discomforting, but we were at least wise if not humble enough to agree that we wanted her to have a home to her liking. 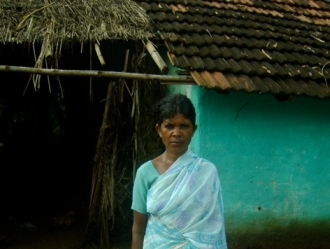 She then matter-of-factly told us to give her the Rs.20,000 and let her build her house the way she wanted it to be. From my own experience (or rather my inexperience), I now strongly believe that communities inherently understand, know, and are capable of their own development interventions.  Can I get my dry firewood? The skepticism at her suggestion must have been obvious on my face. But Medhi went on to explain politely - she and her people had been living in more adverse conditions in the forest for centuries, and knew how to take care of themselves. She felt they had the knowledge and the skill to build themselves a good house that she could augment with modern conveniences like roof tiles and cement plastered walls if she had a little money to buy them with. What she wanted to know was - did we trust her with the money to do exactly this? Those were days of my relative inexperience and I operated with the mistaken impression that I had the solutions to the problems of the people. I was yet to learn the art of listening to the people, understand their problems from their perspective, and build a solution based on their strengths and needs. All that this lesson of Medhi's would cost me was Rs 20,000. Hesitatingly I agreed to advance the money to her. To my surprise, Medhi built a house (which still stands to this day), much larger than what we were building with the money that we gave her. But more importantly, she built her house that she and her family not only designed but also participated everyday in building it. This was the true message of self-reliance that Gandhi wrote so much about. Unfortunately, neither the Government nor many NGOs understand this intricate and sustainable strength inherent in the communities that many of us serve. How wonderful it would be if we make listening and responding to communities a part of the myriad schemes that we design for communities in the name of their development. From my own experience (or rather my inexperience), I now strongly believe that communities inherently understand, know, and are capable of their own development interventions. All that external change agents like us need to learn is to observe and learn from communities, form our own interpretations and if necessary design interventions that are contextually relevant and culturally appropriate. I carry with me the lesson that Medhi taught me then, as I grapple with the complexities of human development.